We all know, at least marginally, what inbound marketing is. For the sake of anyone who might not let’s keep the definition simple here – essentially it is exactly what it sounds like, attracting potential buyers or clients through the use of content and media. The difference between inbound marketing and outbound could be the difference between merely meager sales ledgers, and wholly amazing, year-end results. Whereas outbound marketing will ‘push’ your product through various channels (often coming with a hefty price tag), inbound marketing creates awareness and generates leads for your business, exciting curiosity in people, while still maintaining a trustful relationship with prospects by not being invasive and allowing the customers to come to you. Reading your content or watching your new video or ad is purely voluntary. But once you have content does that mean you’re done and you can sit back and watch the clients roll in? Not necessarily. See, there’s a proven formula for making Inbound Marketing work successfully. Just like any other business tactic, the end result must be justified; to do that, we need to know exactly what we’re going to do, each step of the way. We need to have A PLAN. There is already an established and recognized pattern or cycle of how inbound should work. If you know what steps to take and when to take them, you can easily start to see how this process is benefiting your business and helping it to grow. 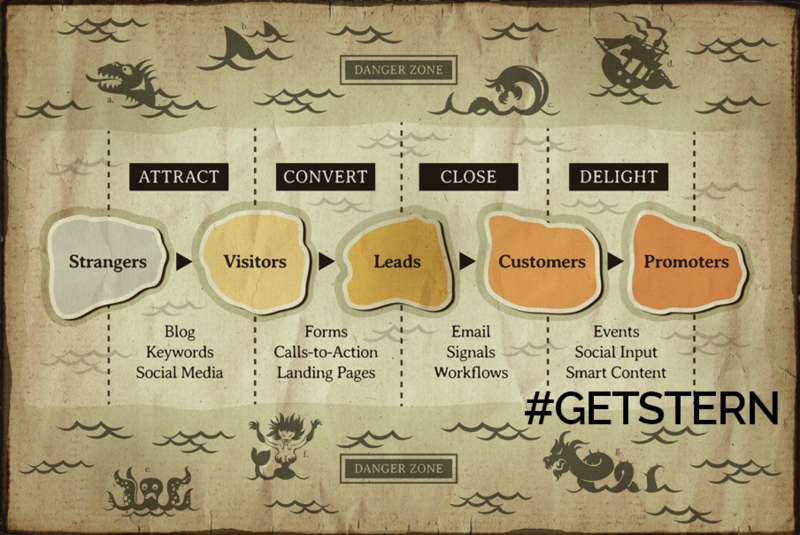 So, what are the steps in a Stern Inbound Marketing Campaign? The first step to creating a successful inbound marketing campaign is to create an alluring landing page and some top-quality content to follow it up with. You want your prospects to find your site appealing, easy to navigate and non-invasive. You also want to make sure that your page is full of information that your clients want more of, which means having the absolute best content for your niche. So, the next step is creating that content and using social media to share your blogs, videos and posts with people. Taking full advantage of the digital age, you can do in months what used to take years for small businesses. Make videos every day or week, continue to offer people on ongoing stream of articles and blogs that are relative and engaging. Then take all that content and share, share, share. Your avid clients will help you share, especially if they know someone who can benefit from your services. Finally, you will want to analyze your data. After some time has gone by, you may have seen some changes in your bottom line, but maybe not what you expected. This is the time to look at all your inbound data and make some decisions about what needs to change and what is working perfectly. Are videos or blogs drawing more response? Maybe the balance of the two is off just a bit. Are your videos/posts too long or short? You get the idea. At Stern Marketing we understand that moving your business towards the goals you have in mind is important. Whether that’s scaling up just enough to keep you working solo, or adding hundreds of new clients a month, we’ve got your back. Using proven methods and our unique system of utilizing ALL aspects of inbound, we help you get where you want to be. Creating content for your company and your clients, we can showcase your products and services to the exact audience you want to target, thereby bringing in the results you need. Why wait another year, only to see meager results yet again? Taking advantage of our Inbound Services and customizable packages will give you an edge over your competition that will surely show in your end of year results. Leveling up in the business world can be hard, especially without a map of what works and what doesn’t. With Stern Marketing by your side, you’ll never get lost in the maze of available products and services. We can offer recommendations for content writers, create marketing videos for you to use on your website and social media platforms, and so much more! Give Stern Marketing a call today and create a backbone for your venture that will carry you into your goals in a smoother, more rewarding manner than you thought possible.